The weighted foot can collapse mid-turn, which creates excess motion inside the boot. Edge control is reduced, resulting in ankle pain and "toe bang". To compensate, boots are over-tightened, causing decreased blood circulation and cold feet. Your feet are supported, stabilized and properly aligned. Increased edge pressure provides better control and balance. Comfort, fit and warmth are dramatically improved. 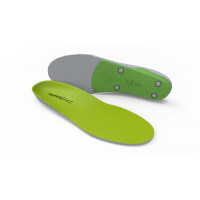 Powering through toe-side turns strains the foot as the heel lifts inside the boot. The feet struggle to find balance during heel-side turns, and shock from landings can be felt throughout the entire body. 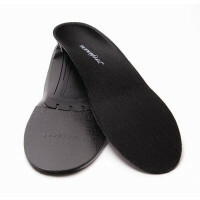 Feet are supported and stabilized, and heel lift is reduced. Balance is improved and energy spreads directly to edges. Boots fit more comfortably and excess motion and fatigue are reduced. 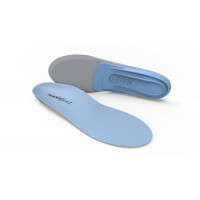 Shock absorption, power and control are enhanced.